Early television and movies portrayed the drunk trying to walk a straight line as proof of intoxication. If that did not work, they were asked to close their eyes and touch their nose. These tests are part of the standard roadside sobriety test. Eventually, arresting officers were issued devices designed to test a driver’s BAC (Blood Alcohol Concentration) which took the guesswork out of the driver’s level of inebriation. That device is a breathalyzer. Today, the breathalyzer is the basis for a thriving business. There are various models no larger than the average cell phone that fit easily into a purse or pants pocket. There is even a new business growing up around a coin operated breathalyzer that bars and restaurants can install for their clients’ use. For much less than the price of a drink, a person can test their Blood Alcohol Concentration to find out if their judgment and motor functions are sufficient to drive. The ability for drinkers to have their BAC measured before getting behind the wheel of their vehicle is reason enough to install the new vending machine. How many lives will be saved due to this new technology? Numerous studies have proven that the average drinker will begin to experience loss of their memory and impairment of reasoning even after one or two drinks. This means that a normally responsible person will lack judgment about their driving abilities and most likely drive when they are too drunk to operate a vehicle. A breathalyzer will provide a definite reading on the Blood Alcohol Concentration, giving the drinker and his or her companions an opportunity to make a more rational decision about driving. 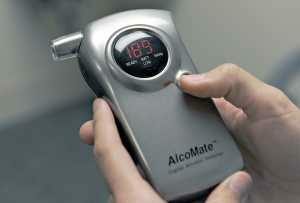 Breathalyzers offer a safeguard against financial loss as well as being a life saving device. There is a national trend by injured parties to bring lawsuits against enablers – the businesses that sell and serve the alcohol. In a major portion of the suits, courts are finding in favor of the injured. It just makes sense to provide some method to identify and help those drinkers who may have dangerous levels of alcohol in their blood systems, especially since it is difficult to impossible for most people to judge someone’s specific level of impairment. For example, after a few drinks, would you be able to tell if you or someone else is over or under the .08% BAC limit? Probably not. That’s one reason to use a breathalyzer (or breathalizer).